As part of my ongoing discussions with Steve Denning about innovation, Steve suggested we look at creating images that represent important attributes of different innovation models. He proposed the first version of most of the models. The comments below are mine, but Steve deserves enormous credit for all his insights and observations. The models shown are proven methods for increasing customer value. Some of the models, like TQM, are primarily for improving product output rather than in defining wholly new innovations, such as with the PoI Playbook. More recent models drive continuous improvement by rapid iteration between the team and the customer. The figures show a simple three-part model: customers, management, and workers. The lines between them indicate the degree of feedback: the bolder the lines, the greater the influence. In all cases “workers” include the enterprise’s staff plus other partners in the market ecosystem. Concepts like open innovation (P&G), the use of application developers (Apple), and engagement of independent contractors (Uber) are assumed, where appropriate. After Ford, innovation models empowered workers and gave them a “toolbox” of methods for improving customer value. Main differences are their connection to the customer, the role of management, and the enterprise’s objectives. 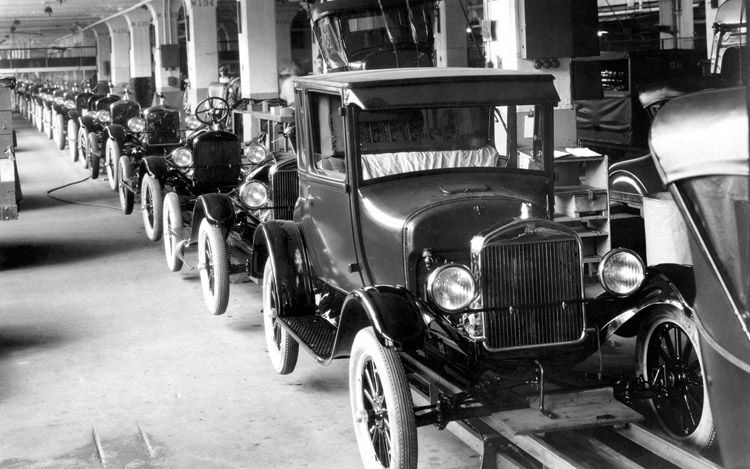 The Ford assembly line was core to a management system committed to radically reducing automotive cost. It was so successful it became the prototype for almost all manufacturing. But the connection to customers stopped with Ford. He famously said, “Any customer can have a car painted any color that he wants so long as it is black.” Innovation mostly came from Ford and a few of his lieutenants. His approach was authoritarian. Workers were hired hands. The Toyota Production System, and its many TQM variants, was designed to produce both low cost and high quality. It was a revolutionary advance that is now used ubiquitously in the production and delivery of products and services. In TPS workers were treated as respected, involved, skilled, and innovative workers — workers who constantly improved the manufacturing process to create even greater customer value. The connection from the customer to worker is weak but the system constantly reinforces the importance of customer satisfaction and improved customer quality and cost. It was not intended to design new products, like the Lexus, but it played a critical role in delivering full value to customers. Agile is a highly effective method to develop applications, such as software or services, where the business model and the product focus are at least partially defined. The central idea is rapid iteration within the team and with customers to incrementally deliver new customer value. Teams are mostly self-organizing using the core principles of the Agile process. In most Agile books the enterprise’s business model is not a focus of concern. It is assumed. Management’s role is also minimized. It provides organization support, sets up the Agile process, and then must, as Jeff Sutherland says, “Get out of the way.” It is a powerful methodology when the team understands the projects goals and the time frame is relatively short — generally months; not years. It provides an excellent framework for rapid product development. Agile is not intended to create disruptive innovations, but it obviously can be part of the process for developing them. In addition, other processes can be added to make it more effective. Indeed, any process that includes constant team iteration with customer feedback can create excellent results. This is especially true when compared to what most enterprises do today, where customer needs are often missing. Creative is a category described by Steve Denning. It can be considered a unique application of the Agile approach. Creative is a growing area, where real-time, continuous customer value creation is required for the company to thrive. Responding to changing customer needs has always been an enterprise imperative, but in the global innovation economy the response time required is increasingly rapid. In turn, the co-creation cycle between innovation teams and their customers must also become more rapid. Steve Denning points out that an exemplar of this model is a company called Riot Games. It provides real-time services for computer gamers. The company’s business model includes an Agile-like value-creation process with close customer involvement. It is similar to TMS in that it is integral to their business model, but now the focus is not just on quality and cost, but on all the dimensions of customer valve. This is essential because gaming customers require constant, almost real-time product evolution. New games, technology, and gaming fads can turn customer’s needs upside down in weeks. Riot Games’ game is to chase both the games and the gamers. Real-time, customer co-creation is the only way to do that. 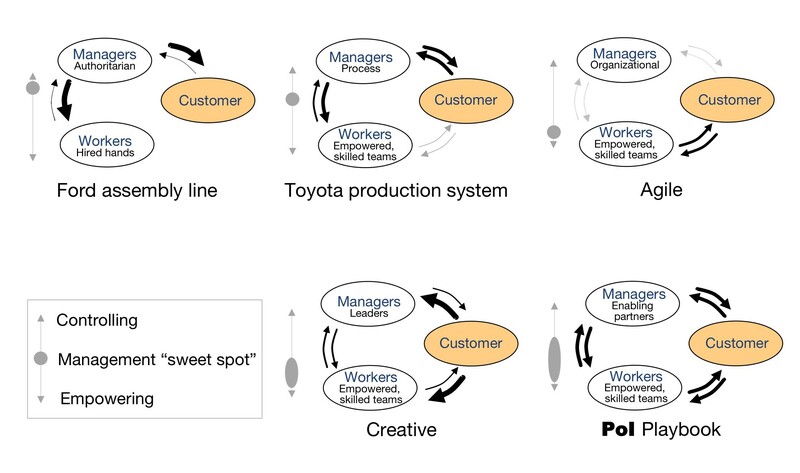 The management sweet spot is elongated in the figure because it takes a flexible mix of top down and bottom up to make the Creative model work. Most of the time the teams are self organizing but management must be closely connected to help define major changes in the market and the company’s product mix. Again, the time scales between market shifts can be very short. Riot Games is an extreme case, but it is an excellent one just for that reason. In Alice in Wonderland the Red Queen said, “Now, here, you see, it takes all the running you can do, to keep in the same place. If you want to get somewhere else, you must run at least twice as fast as that!” For most it would be a very challenging business model. There are increasing market segments where a version of this approach is required, such as food (ice cream flavors), clothing (fast fashion), entertainment (blogs), etc. In other words, those market areas where fashion, fads, and other rapid changes are driving forces. In a world where real-time personalized manufacturing of products is increasingly the norm, Creative will undoubtedly apply to many consumer products as well. The PoI Playbook was designed for the other end of the spectrum from Agile. Its primary goal is the creation of multibillion-dollar, disruptive innovations. It has done just that at SRI International and other enterprises. What it shares with Agile is customer focus, rapid iteration, customer co-creation, mostly self-organizing teams, positive human values and incentives, and a specific methodology that assures a high level of success. From PoI Playbook’s perspective, TQM, Agile, and other methods, such as promoted by the d.school, Bio-X, IDEO, Aalto, etc. are all powerful tools to be used as needed as the new venture evolves. They can be used either as part of the solution or as a means to help define the solution. They all have in common a commitment to addressing customer needs with rapid co-creation, which is extremely powerful. The PoI Playbook’s objective is to rapidly create a compelling hypotheses for both the product offering and the business model. Until that is done, other efforts are usually premature, if not total waste. Almost all innovative efforts fail for those two reasons — no customers and no business model. The management sweet spot is even more elongated with the PoI Playbook. Again, most of the time the teams are self organizing but management must be closely involved to help define important market and customer needs, locate resources, drive the PoI value creation process, and help create a compelling hypotheses for both the product and business model. Summary: The innovation model you use depends on what you are trying to achieve. Agile and the PoI Playbook are bookends. Apple, for example, uses both. When we created HDTV at the Sarnoff Corporation (owned at the time by SRI – it is now part of SRI) we used many innovation models, as required with a huge software and hardware project with many partners and multiple customers, including the government’s FCC. Siri used the PoI Playbook for three years before we spun it out of SRI. Until that point there was no business model, even though we knew how to build the product. At the end of the PoI Playbook phase we then used rapid customer co-evolution to refine the product before company launch. These are all powerful, proven models for improving innovative performance and increasing customer value. By using each as appropriate you can greatly improve your performance.